Coach Warren Gatland says Wales can "bring home the World Cup" by playing "as well as we have for the last year". Gatland's side clinched the Grand Slam with victory over Ireland on Saturday and have set a national 14-match winning record. In that time they have beaten South Africa twice and Australia, who they meet in the pool stage in Japan. "I know that these guys won't go down in any match without a fight," Gatland said. Wales have overtaken Ireland in the World Rugby rankings to move second behind World Cup holders New Zealand. 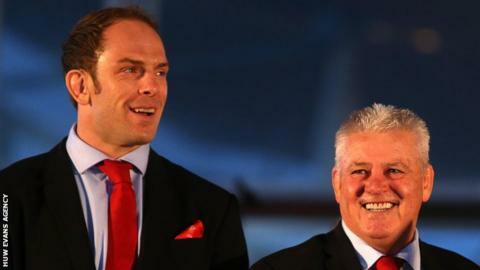 Gatland's tenure as Wales coach ends after the World Cup and speaking at an official ceremony in Cardiff to celebrate the Six Nations win, he added: "We've got a very special group of players at the moment. "We enjoy each other's company, we challenge each other on a lot of things, but once we make a decision we back each other 100%. "I promise you that these guys will give 100% in every game at the World Cup." Gatland is celebrating a record third Grand Slam as a Six Nations coach and has also guided the British and Irish Lions to a 2013 series win against Australia and a series draw against the All Blacks in 2017. In their World Cup pool, Wales face Georgia, Australia, Fiji and Uruguay with August warm-ups against England and Ireland, the latter twice. "You need a little bit of luck and hopefully we don't pick up too many injuries," added Gatland. "There's some real depth, some real competition in this squad and that makes it tough on us as coaches. "There are quality players that will miss out on the 31-man squad and that will be incredibly tough. Wales have twice reached World Cup semi-finals, the last time in 2011 in New Zealand under Gatland, where they were beaten in the last four by France before losing to Australia in the third-place play-off. In the inaugural tournament in 1987 they beat Australia in New Zealand to finish third - their best finish.